No teams, the rotation is attack, defend, go off. 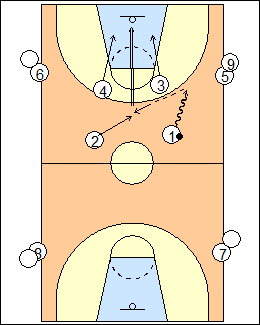 1 and 2 attack against 3 and 4, play to a stop or score, other players are on the sidelines, foul-lines extended. 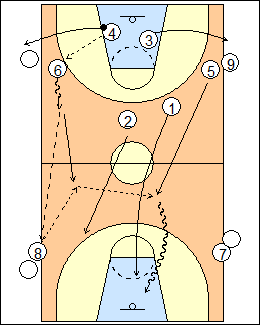 5 and 6 are the next attackers (they step on the court), getting an outlet pass from 3 or 4, who go off, 1 and 2 get back on defence, the ballhandler immediately throws it ahead (up the sideline) and gets it back, play to a stop or score. This works on precise passing, throwing the ball to an open guy ahead of you and following behind your pass. 1 and 2 outlet to new attackers, who pass up the sideline for a return pass, 5 and 6 get back to defend. Progression - no pass-ahead is needed, dribble with your head up, tougher on the defence (guard the basket). 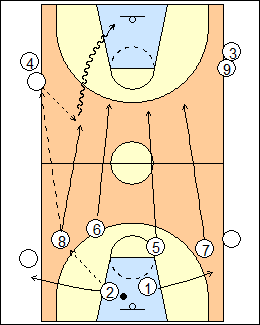 See Transition - 2 on 2 on 2, Sharks.